Thrifty and Frugal Living: Ended- TERRO Ant Killer Review and Giveaway-2 winners! Ended- TERRO Ant Killer Review and Giveaway-2 winners! About 4 months ago I noticed an Ant in my kitchen. I have never seen ants in there before, so I just killed it and didn't think much about it. 2 days later, they had taken over the kitchen. Everywhere we looked there were ants! I researched online and found several home remedies: place Bay leaves or Cinnamon around the areas where the ants enter the room, pour vinegar on your shelves, etc. After spreading half of my spice rack on the cabinets and window, I realized none of this was going to work. Then, luckily I discovered TERRO. 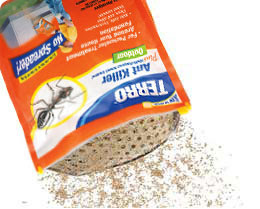 TERRO® is the industry leader in ant control and has been a trusted brand for more than 90 years. Based in St. Louis, Missouri, the company offers proven ant control products, including liquid ant baits, aerosol sprays, perimeter granules and ant dust. TERRO products are widely distributed at all leading hardware, home center, mass merchant, food and drug, farm and fleet and independent garden center retailers nationwide. For more information visit TERRO. Liquid baits are surprisingly simple in the way they work. TERRO liquid ant baits are made from a natural ingredient, Borax, which is safe to use around humans and pets, but is deadly to ants. As the ant foragers look for food, they are attracted to the sweet liquid in the baits. Unsuspectingly, they consume the liquid and carry it back to share with the colony. The result is the elimination of the colony - and your ant problems. Since most ant infestations are linked to a colony that is actually located underground outside the house, the second line of defense is setting up a barrier around your house. Once a house has been baited inside for at least a week, begin applying TERRO Outdoor Ant Killer Granules around the perimeter of the house. After my failed attempts at "home remedies" I was very excited to try TERRO. I received both the Liquid Ant Baits and the Outdoor Ant Shaker Granules to try their 2 step approach. I first placed the Liquid Ant Baits throughout my kitchen and on the window seal in the kitchen (making sure my cats could not get to them). Then, a few days later I sprinkled the Outdoor Ant Shaker around outside my kitchen wall and window. I live in an apartment, so I couldn't do the whole parameter. I was worried that this might not be enough to keep the pests away. Guess what? It worked! Within the first day or two I noticed less ants. After a few days, they were all gone. No more worrying about ants in the sugar or chocolate or anything else. I love TERRO! I had to waste so much food when I had ants because they kept getting into everything. There was even one day when I went to bite into a piece of chocolate (it was wrapped and no where near the ant infestation) and I had ants crawling on it! Yuck! I didn't eat chocolate for a while after that one. What I really loved about the TERRO products (other than the fact that they work) is that they are super easy to use! The Outdoor Ant Shaker is particularly brilliant. It makes it so easy to protect the parameter of your house and you don't have to worry about touching the chemicals. This is also a great smell-free way of riding your home of pests. I have used sprays and bombs in the past and they stink. They also make you feel like you have chemical poisoning yourself. No worries with TERRO's 2-step system! TERRO can be found at most places you already shop: Walmart, Kmart, Walgreens, Home Depot, Lowe's, Ace Hardware, etc. Go here for the full list. 2 lucky readers will get both the Liquid Ant Baits and the Outdoor Ant Shaker Granules to try their 2 step approach. Visit TERRO and tell me which other product you would like to try. TERRO Ant Killer Review and #Giveaway -2 winners! (04/12) http://goo.gl/fb/FwsT #contest #win @Latsyrc728 @TerroDeadAnts Please RT!! Giveaway ends 4/12/10 at 9pm EST. Giveaway is for US residents only. No P.O. Boxes. Winner will be chosen randomly. Winner will be contacted via e-mail and then will have 48 hours to respond before a new winner will be chosen. I'd also like to try the fruit fly trap. I would like to try their multipurpose insect spray. The bugs are huge here! Any of their products would be great.